Which sock are you on? I ended up having a reasonably creative afternoon today, after being pretty staid (and sleepy) all week. General messing around with ribbon (see that cute little bow? ), wire and acrylic paints. I've never used anything other than watercolours or poster paints before, so this is an interesting (and blobby) new medium for me. I like its versatility and its ability to cover stuff up, it's great for altering plastic and metal things that otherwise would be useful but unpretty. For example, this is what I shall for the sake of argument call my "uterus tin", which contains things that I generally like to keep conveniently by my bed. I think it came from a charity shop, and it used to have a logo on the top left corner, but no more! The pink is acrylic paint and the black is shoddily-applied permanent marker (I will be going over the baskets in paint, they look completely awful in reality). Okay, I'm incredibly narcissistic about my drawing style but I really like these little heart balloons, not least because they bring together my love of buoyant aircraft with some appropriately red and suggestively-shaped imagery. Also - aww, can you see the little polka-dots? Awwww. I would at this point like to share with you a song that was written by a completely wonderful young woman of my aquaintance named Iona (otherwise known as my future bride). "Which Sock Are You On?" - to be sung to the tune of "Which Side are you on?" Oh knitters can you stand it? or are you knitting two? We would have the most adorable revolutionary knitted children together. 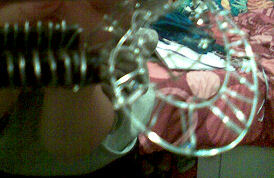 Now, onto the wire issue (and by "issue", I pretty much mean "thing I made") - necklaces are pretty! And they get tangled together if you put them in a box, I have found through extensive research. So, I think to myself, what could stop this awful chain of events? Why, hooks of course! 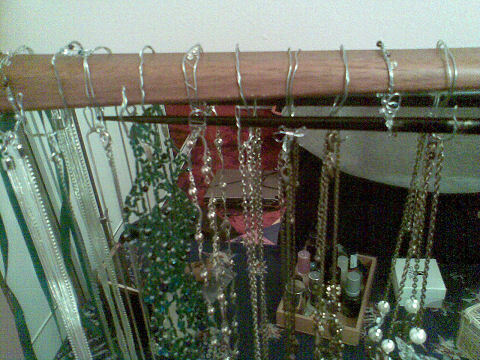 And so I got some wire and some sparkly beads and made some hooks. And lo, it was good, if somewhat difficult to photograph. I'm really happy with how this came out, since the hooks are quite nice to look at and they show off my jewellery, which is also rather nice to look at. Speaking of nice to look at... somebody wonderful (she is one E away from Astride) made me the moon on a stick for Christmas, which is where this whole mad wire idea came from. I know the nicest people. The book I am reading (which was leant to me by someone who definitely comes under the category of "nicest people") is called "Bad Science" and it is by this guy, who you may recognise from the Guardian.Â It's basically a nonsense shredder - a very approachably written critique of health fads, with an excitable attitude towards the scientific method which I find very appealing. I'm only up to the bit about homeopathy so far because for some reason my employers don't like me reading when I'm supposed to be doing things. I should talk to my union. 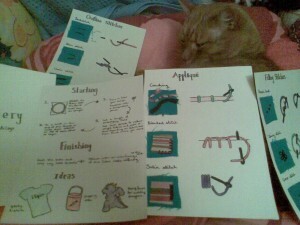 Embroidery, pictures and one unhappy kitty. Ah, the sweetness of gainful employment. I have returned to my local hospital to work as a ward clerk, envelope stuffer, PA and/or general skivvy. And I love it. There's something lovely about being good at a somewhat mindless job. I think that's one of my themes for this year: allowing myself to be good at things. Challenging myself doesn't necessarily mean doing something more difficult - sometimes it just means doing an easy thing better. Modeled charmingly by my cat. Other recent news: for a Craftster swap (I'm angel-ing, I wanted to give myself a craft challenge) I've made a little "How to Embroider" kit for my partner. It has demonstrations of stitches on squares of fabric and then an illustration of how to do the stitches. I really enjoyed drawing the pictures - and I consulted a stitch dictionary for a lot of them and so have incidentally learned some new stitches! I like embroidery, since I feel like it fits with my style of artwork, and it's an easy way to make incredibly geeky t-shirts (sucrose molecule, anyone?). Now I've done this I think I'll be exploring it some more. 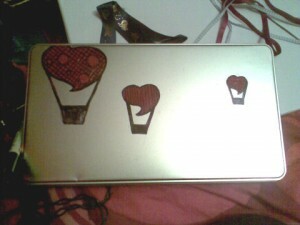 And I think I'll embroider something to put inside the parcel as well! So, I made some gloves. They're pretty much an incredibly simple riff on Ysolda's Garter Stitch Mitts, with a bit of lace and a couple of buttons. 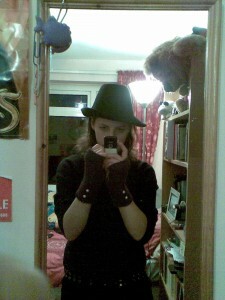 This picture was chosen mainly to illustrate that I have an awesome hat. Seriously. I am now contractually obligated to fight crime because of it. Right, yeah, the gloves. I actually started them as a present for a male friend of mine - then I thought "hey, these would look great with some lace!" and they became a present for, well, me. So I can fight crime with them. Apologies for the bad photo; turns out it's really difficult to take a picture of your own hands. Who knew? These were a quick, easy but still interesting knit, and quite comfy to wear. They keep your fingers and thumb free to fight crime. 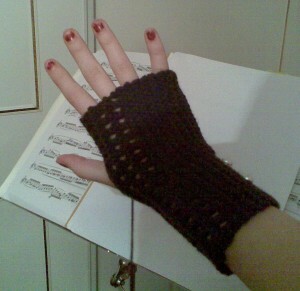 However, I think there isn't quite enough short row shaping, leaving the wrists too loose. Continue reading Crime-fighting garter stitch mitts.